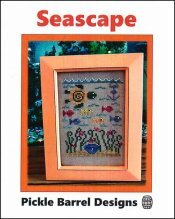 Seascape [G1739] - $6.00 : Yarn Tree, Your wholesale source for cross stitch supplies. Cross stitch pattern by Pickle Barrel Designs. Look at these adorable sea creatures! Blue fish, yellow fish, orange fish....and a turtle are all taking a swim in the water. Lookout for that anchor hanging down! Don't let this design swim away before you get it stitched! Stitch count is 47 x 66.